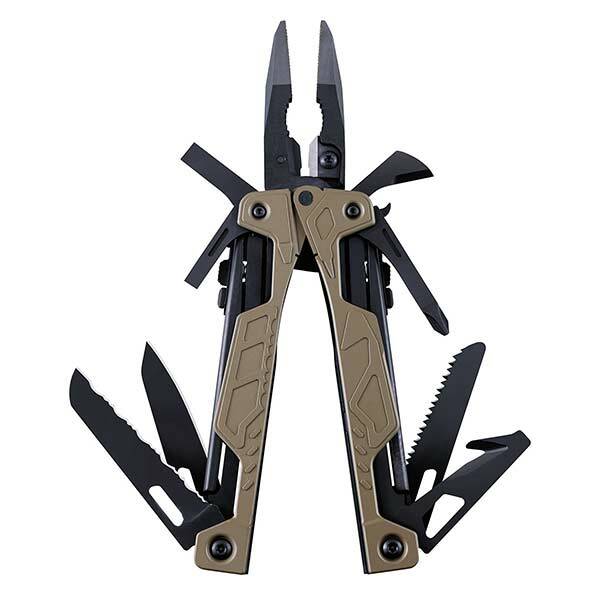 Starting from an incredible idea of a pliers pocket knife set up the Leatherman brand has developed extensively into high quality and innovative Multi-Tools, Wearables, Knives, Pocket Tools and Accessories. 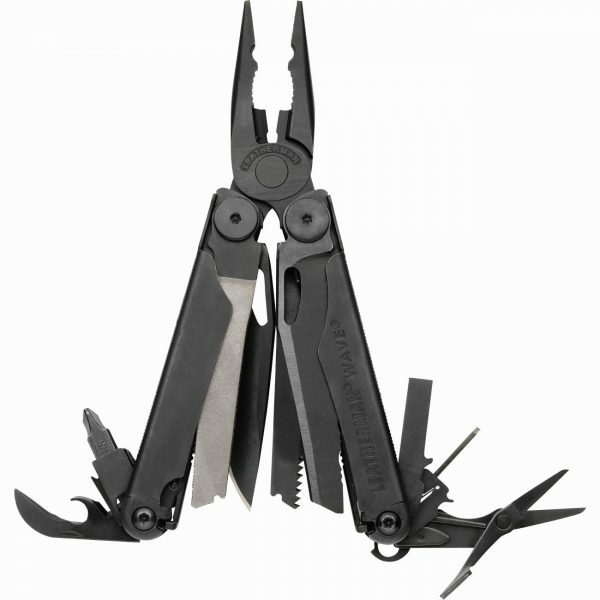 For years multi-tool users could choose from two distinct options when it came to a "one-hand-operable" multi-tool: one-hand-opening pliers OR one-hand-opening blades. 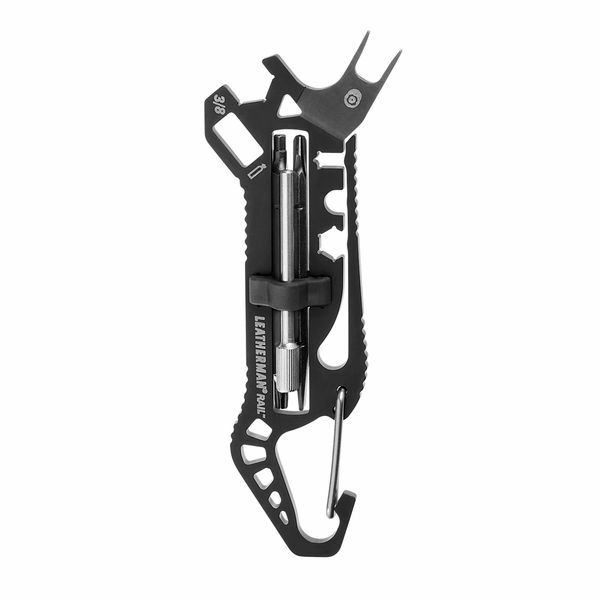 Today, Leatherman has taken these two well-loved ideas and fused them into the first ever, 100% one-hand-operable multi-tool, the Leatherman OHT. This industry-first tool features spring-loaded pliers and wire-cutters so you don't tire your hand adjusting and readjusting your grip. Handles with visual imprints of the tool beneath make for quick identification. A lifesaving strap cutter and oxygen bottle wrench, threading for common-size cleaning rods and much more make this a one-handed workhorse of a tool. Tools & Blades: Spring-action Needlenose Pliers Spring-action Regular Pliers Spring-action 154cm Replaceable Wire Cutters Spring-action 154cm Replaceable Hard Wire Cutters 420HC Knife 420HC Serrated Knife Phillips Screwdriver Small Screwdriver Medium Screwdriver Large Screwdriver Saw Strap Cutter Can Opener Bottle Opener Oxygen Tank Wrench #8-32 Cleaning Rod Attachment Integrated Lanyard Attachments 14 15 16 17 4 5 6 7 3 PIECE 2 BIT KIT PIECE BIT KIT 9 PIECE BIT KIT 10 PIECE BIT KIT 1 Specifications: - Length:11.5 cm - Weight: 281 g - Materials: Stainless Steel/Cerakote™ finish - MOLLE* Sheath - Colour: Black *MOLLE stands for Modular Lightweight Load-Carrying Equipment and is used to define the current generation of load bearing equipment utilised by the US Army. 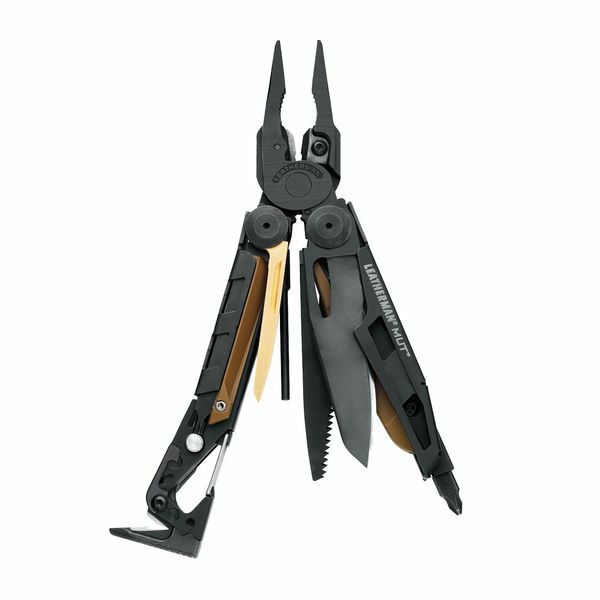 For years multi-tool users could choose from two distinct options when it came to a "one-hand-operable" multi-tool: one-hand-opening pliers OR one-hand-opening blades. 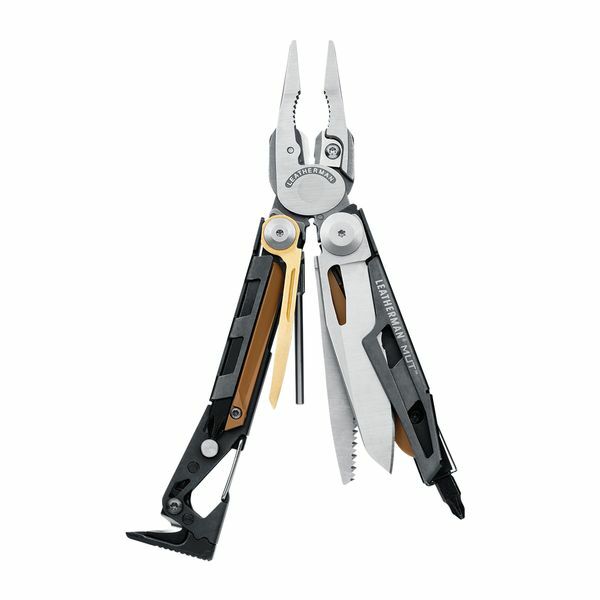 Today, Leatherman has taken these two well-loved ideas and fused them into the first ever, 100% one-hand-operable multi-tool, the Leatherman OHT. This industry-first tool features spring-loaded pliers and wire-cutters so you don't tire your hand adjusting and readjusting your grip. Handles with visual imprints of the tool beneath make for quick identification. A lifesaving strap cutter and oxygen bottle wrench, threading for common-size cleaning rods and much more make this a one-handed workhorse of a tool. Tools & Blades: Spring-action Needlenose Pliers Spring-action Regular Pliers Spring-action 154cm Replaceable Wire Cutters Spring-action 154cm Replaceable Hard Wire Cutters 420HC Knife 420HC Serrated Knife Phillips Screwdriver Small Screwdriver Medium Screwdriver Large Screwdriver Saw Strap Cutter Can Opener Bottle Opener Oxygen Tank Wrench #8-32 Cleaning Rod Attachment Integrated Lanyard Attachments 14 15 16 17 4 5 6 7 3 PIECE 2 BIT KIT PIECE BIT KIT 9 PIECE BIT KIT 10 PIECE BIT KIT 1 Specifications: - Length:11.5 cm - Weight: 281 g - Materials: Stainless Steel/Cerakote™ finish - MOLLE* Sheath - Colour: Coyote Brown *MOLLE stands for Modular Lightweight Load-Carrying Equipment and is used to define the current generation of load bearing equipment utilised by the US Army. AR maintenance has never been more easy or lightweight. The Leatherman® Raptor® is the tool of choice for paramedics, ski patrollers and emergency tactical operators. 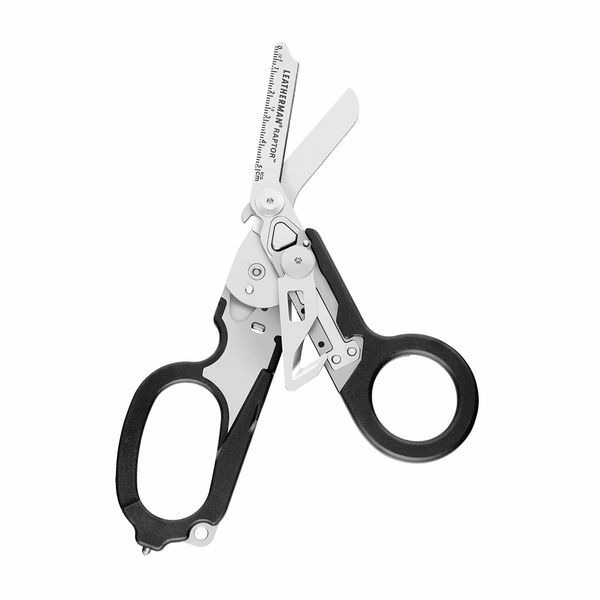 The Leatherman Raptor shears feature the necessary tools for uniformed medical professionals to safely and quickly go to work in an emergency situation. Developed with the input of special operations medics, EMTs and fire professionals familiar with standard medical shears, the Raptor was crafted with just the right balance of multipurpose features for medical-specific ops without an overkill of tools to complicate sometimes life-threatening situations. When it's a question of survival, the Raptor answers loud and clear. Holster included. Features: 1. Utility Belt Holster System 2. Lanyard Hole 3. 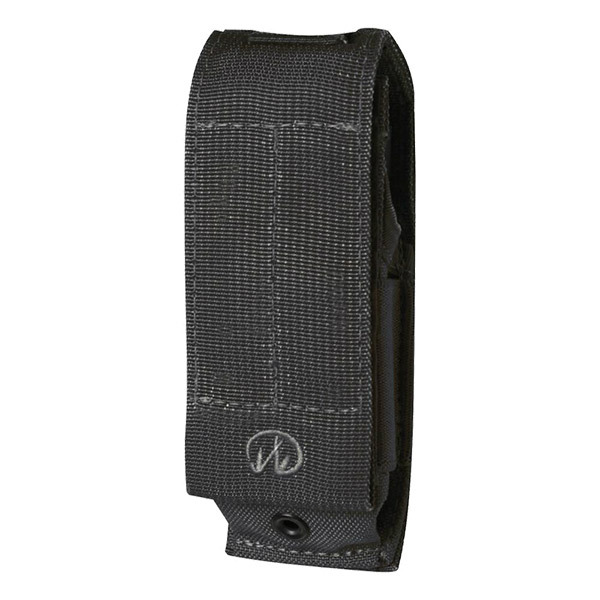 Replaceable Pocket Clip The Tech: Colour: Stainless Steel/Black Sheath: GFN Holster Closed Length: 12.7 cm Weight: 164 grams Shear Length: 4.8 cm Blade Metal: 420HC Stainless Steel Warranty: 25 years - manufacturer Model Number: YL68010281 Special Feature: Glass Filled Nylon Handles - A thermoplastic material where strength is improved by adding chopped glass fibers. This allows for excellent durability without adding significant weight. In Leatherman knives, the glass-filled nylon handles are so strong that an inner steel frame is not required, thereby reducing weight for a lighter every day carry. 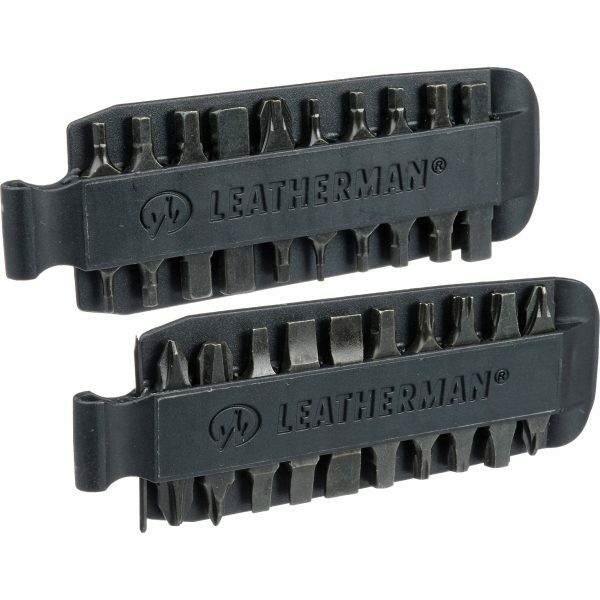 Leatherman uses a 60% glass mix. RAPTOR® TOOLS 1. 420HC Stainless Steel Folding Medical Shears 2. Strap Cutter 3. Ring Cutter 4. Ruler (5 cm) 5. Oxygen Tank Wrench 6. Carbide Glass Breaker Specifications: Closed Length: 5 in | 12.7 cm Weight: 5.8 oz | 164 g Shear Length: 1.9 in | 4.8 cm Materials: 420HC Stainless Steel: An improved, high-carbon (HC) form of 420 stainless steel that works well with high production tooling. 420HC's strength is optimized in Leatherman multi-tools by heat treatment. Black Oxide: Black oxide is a powder-based metal coating. Ideal for situations where giving away a position would be costly, it is widely used by the military for its effectiveness in reducing glare and reflections. 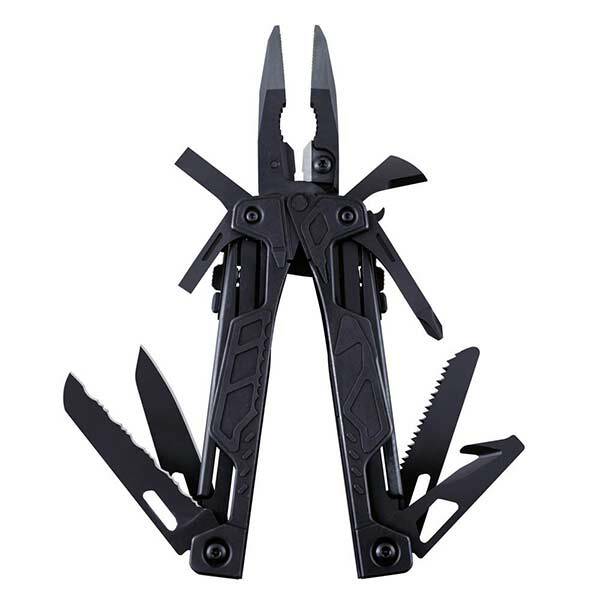 The Leatherman Wave multi-tool is hands down their most popular model, made famous by its outside-accessible blades that can be deployed with just one hand.